While gathering information and client comments to prepare for the upcoming launch of our Treating IBS Naturally program, I was quite unnerved by a common problem that I knew people had. I just wasn’t fully appreciating the seriousness of it. Constipation is one of the major symptoms of IBS and its severity can range from mild and unnoticeable to debilitating and severe. A few people shared stories of having battled the constipation for years, and having suffered terribly as a result. Constipation is quite simply an infrequent or halted bowel pattern. The effects, however, are anything but simple. People who have “occasional irregularity” like they describe in the happy sing-songy commercials have probably experienced some irritability, bowel pain, and general inconvenience as a result of their mild constipation. Others, though, have battled this debilitating symptom in its worst incarnation- not the mild irregularity but rather the full-blown genuine medical emergency. For some, it’s difficult to think that not being able to move the bowels for a couple of days could constitute a genuine medical emergency, but it’s not just those couple of days that cause the problem. If you’ve ever had surgery, you know that in the post-operative instructions you have an item that says to call the doctor right away if you are faced with not moving the bowels for more than 3 days. For some surgical procedures, you might not even be discharged until you’ve moved your bowels. But what if it doesn’t work? That’s why you have to call the doctor, because he or she knows that bad events are on the horizon if you don’t get help right away. One person who wrote in described his ordeal of having gone to the emergency room because of the excruciating and unbearable pain he experienced. He had been essentially without movement for 6 days and knew something was wrong but decided to try and “tough it out” at home. His wife was the one who poured his shaking, sweaty, pale body into the family minivan. She thought he was having a heart attack. When they got to the ER and the doctor did his exam, he knew immediately what the problem was. A simple enema solved his problem, but anyone who has ever had one of those knows it’s no trip to the park undergoing that unpleasant procedure. What caused his wife to take him in? Simple- he could no longer argue with her and say “No, I’ll be fine.” He had long passed the point of manly stoicism. He was experiencing a genuine medical emergency. What would have happened if she didn’t act? No one likes to think about that. 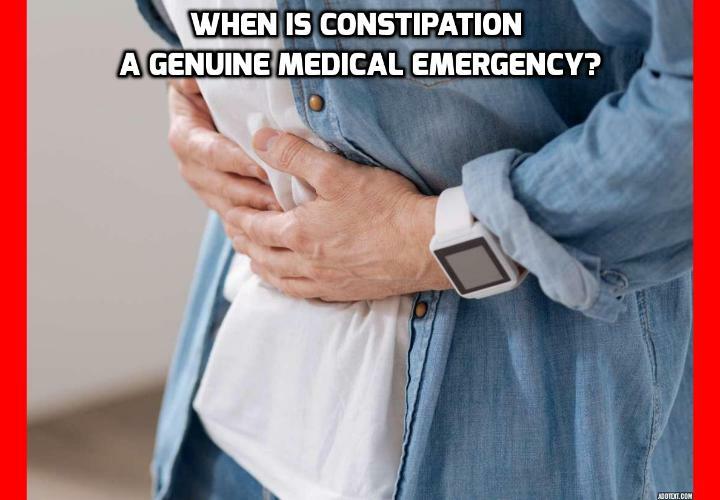 For a genuine medical emergency to exist, you don’t have to have all of these characteristics of a severe problem with constipation. Even just experiencing a lack of bowel movement for more than 5 days in the absence of all the others is enough to require immediate treatment. The man who wrote in was looking for answers to his chronic constipation, as so many others frequently do. I found myself offering the same advice to each person, but because bowel conditions had previously fallen outside the scope of my research I wasn’t able to help everyone as I wanted…until now. I am happy to announce that very soon I will be releasing the program for Treating Irritable Bowel Syndrome Naturally and have found someone whose own life has been affected by the terrible effects that come with severe constipation. In her guide, Julissa Clay describes a comprehensive and easy-to-follow plan to treat IBS naturally. It’s called “psyllium husk,” and while it is most well-known for being a powerful constipation-buster, it provides other exceptional health benefits too… including the Top 8 you’ll learn below! 14 Times the Fiber as Oat Bran! Psyllium husk is the outer coating of the psyllium seed. Each tiny husk is made up of about 70 percent soluble fiber and 30 percent insoluble fiber. Both types of fiber are important; soluble fiber, for instance, which dissolves partially in water, helps slow your digestion, making you feel full longer (this is why soluble fiber is sometimes described as a weight loss tool). This type of fiber, which makes up the bulk of psyllium husk, is also known to improve insulin sensitivity (a major bonus if you have diabetes) and help lower your LDL (bad) cholesterol. Insoluble fiber, which does not dissolve in water, adds bulk to your stool, making it a great aid for relieving constipation and helping with digestion. When looking to add more fiber to their diets, many assume this means resorting to daily breakfasts of bran muffins and lunches of raw broccoli — but psyllium husk actually has more than 14 times the fiber as oat bran (71 grams of fiber in one-third cup of psyllium husk compared to 5 grams for oat bran). Health Benefits of Fiber-Rich Psyllium Husk #1 – It’s Hygroscopic! This is a fancy way of saying the husks expand in water, forming a gel-like substance that is invaluable for regulating your bowel movements, helping to transport waste through your intestinal tract and cleansing your colon. Psyllium husk can help make your stools softer to pass, which is a key way to help lessen pain associated with hemorrhoids. Psyllium husk adds bulk to your stools, which helps your intestines to contract and pass the stool — an essential benefit if you’re constipated. On the other hand, psyllium absorbs water, which is helpful if you have diarrhea because it will help to firm up and slow down the passage of stool. The U.S. Food and Drug Administration (FDA) has approved a health claim for use on food labels stating that the soluble fiber from psyllium husk is associated with a reduced risk of coronary heart disease. Psyllium husk has been found to help lower triglycerides as well. Adding psyllium husk to your diet has been found to improve glycemic control and hyperlipidaemia in people with type 2 diabetes. Psyllium husk may significantly benefit the cluster of symptoms such as high blood pressure, insulin resistance, and overweight that describe metabolic syndrome. Its beneficial impact on insulin sensitivity, cholesterol levels, triglycerides and even blood pressure and body weight make it particularly useful for this condition. Most studies show that appetite tends to decrease after psyllium is consumed, which suggests it may play a role in controlling body weight and body composition. The husks swell and expand in your stomach, helping you to feel full, naturally. If your psyllium husk is ground into a powder that’s flavored and colored with artificial additives and sugar, take a pass. Many of the most popular brands on the market actually taint the health benefits of natural psyllium husk by adding in artificial colors, flavors and even sugar or artificial sweeteners like aspartame. When seeking a truly health-promoting product, you need pure, unadulterated psyllium that contains NO additives. If you take it in powder form, be sure to drink it with a full glass of water to prevent choking and ensure the bulk is able to pass freely through your intestines. Where or How You Can Easily Get The Health Benefits of Psyllium Husk? This is THE most cutting-edge solution for flushing out the dangerous TOXINS that have been building up in your body for years or even decades… while also soothing inflammation of your GI tract, and replenishing good bacteria to help rebalance your gut microflora. As you see, using psyllium husk can be VERY SMART indeed… So why not get the purest and best form of it along with all these other synergistic effects in Natural Cleanse, too? Best of all, today you can try Natural Cleanse at 30% and FREE SHIPPING! Click Here to Learn More and Try Natural Cleanse!